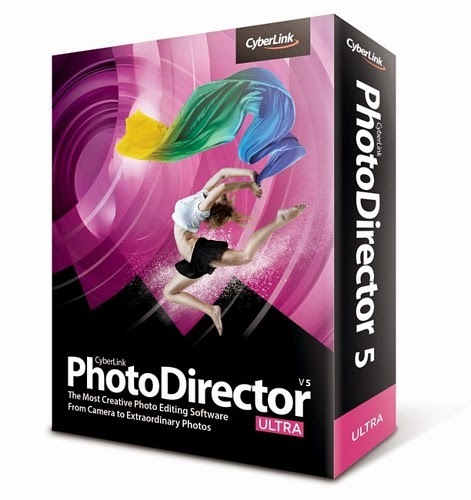 البرنامج العملاق لتحرير الصور و تعديلها و التلاعب بها و اضافة الكثير من التأثيرات بها CyberLink PhotoDirector Ultra 5.0.5214 من أقوى برامج التعديل على الصور ويشمل مجموعة من الأدوات الرائعة لتعديل الصور ومراقبة توازن اللون الأبيض، وتصحيح الألوان، والحد من الضوضاء، والسطوع والتباين في الصورة، والقضاء على العيوب في الصور وإزالة العين الحمراء وازالة الحبوب من البشرة وإزالة التجاعيد وإزالة الخلفيات التى خلف الصور وأيضا من خلال البرنمج تستطيع رفع الصور لمواقع التواصل الاجتماعي PhotoDirector is a unique application that combines all the features you need for photography in a single workflow – efficient photo management, complete adjustment and creative editing. With native 64-bit support, PhotoDirector enhances your photos in a non-destructive process, and RAW support for popular DSLRs and 4K Ultra output, PhotoDirector is all you need to turn your photos into works of art. CREATIVE PHOTO EDITING - Explore your creativity with easy-to-use tools to transform your photos into works that capture the imagination. - Unique People Beautifier Tools contour figures and take away the extra pounds that cameras put on. - Lets you reshape only the parts you want to adjust in your portrait photos and leave the rest untouched - Unlike simple red-eye removal, Eye Blinger enhances whites of the eyes by removing color casts and bringing out the color of the eyes. - To create smoother, youthful looking skin, use the wrinkle removal to retouch imperfections and blemishes in specific areas. - Smooth out skin and even out tones to give your portrait a professional look with the Skin Smoother and Eraser tool. - The Tooth Brush makes it easy to whiten teeth. Select the Eraser tool and you can fine-tune the areas where you applied the brush. - Merges up to 5 bracketed shots into a single high dynamic range (HDR) photo with automatic alignment and ghost artifact removal. - Remove unwanted objects or people from photos automatically by intelligently filling in the background area. - Easily extract ojects from images and transfer them as overlays onto other photos. Includes intelligent tools to select objects or people to extract. - Improve photos by removing distracting wires and power-lines using the versatile content-aware removal feature. - Apply black and white, blur, sepia and tint effects. Use brush tools to mask areas you want to remain untouched. - Design your watermark with titles, frames, and images. Add copyright, camera model, exposure, aperture, shutter speed and ISO information. EFFICIENT PHOTO MANAGEMENT - Our photo collections grow quickly. PhotoDirector lets you manage, adjust, edit and export photos in one intuitive application. - Organizing photos in your library is almost effortless with automatic face tagging. - Automatically organize, apply quality adjustments and presets during import to save time. - Add and edit the IPTC metadata of an image—including shutter speed, exposure information, capture date, ISO, etc. - A handy way to create groups within larger folder-based photo sets—combine a group of images with a similar frame of reference. - Within the Photo Library Module, choose between different viewing modes to compare images. View two photos side-by-side in Compare Two mode or multiple photos at the same time in Lightbox Mode. - Choose between three different modes (single/compare/grid) to compare the original photo with edited images to decide if the adjustments you applied are the exact effect you were looking for. 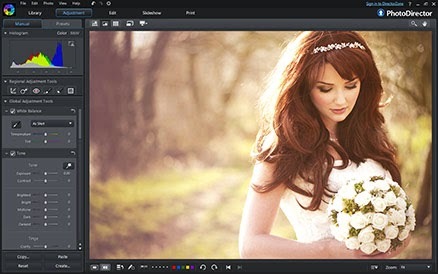 - Edit your photos while viewing them in several layout options. Display a large portion of the image as well as a small filmstrip of thumbnail images simultaneously to conveniently and quickly apply adjustments to several photos. - RAW files provide higher quality information and more flexibility in processing than other formats, but processing them can result in frustrating delays. - PhotoDirector 5 solves the problem with new RAW processing technology that's faster than ever. Nearly 3x faster than the previous version, and up to 40x faster than leading competitor software, PhotoDirector 5 gives you more time to perfect your photos and less time waiting for them to process.